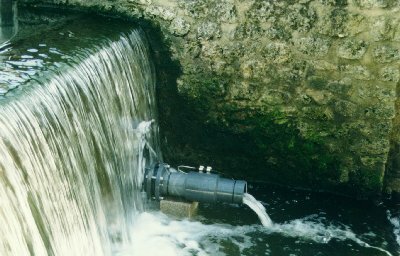 Micro-stations HYDROPOWER, functioning with low pressure, can easily be installed on small rivers whose flow is a few tens of liters per seconds. The energy produced by the turbine lies between 50 and 300 W, according to the hydraulic possibilities of the site and the requirement in electricity into 12 or 24 VCC. The necessary pressure to operate is a function of the available water flow and generally lies, in this type of application, between 0,1 and 1,5 bars (1 to 15 m). These conditions can be obtained either by a small dam on the little river, or by a mini pressure conduit tapping water upstream from the installation. The micro-stations HYDROPOWER of small power, that function permanently produce a daily electric power, which is interesting for many professional applications, such as the feeding of automatic measurement stations, analysis and water treatment devices, radio equipment, electric protection enclosures of water tapping, etc. ..They are interesting too in case of electrical appliances of strong power that don't work for long time and which feeding is punctually provided by the battery, by example for motorized valves. They can also provide which an auxiliary electric power any habitations situated far away from the electricity distribution network, for example the country cottages or the mountain refuges.